LUCI announced the debut of their new LUCI immers. 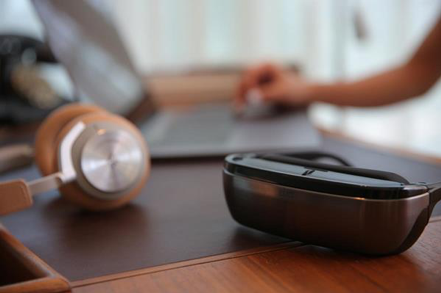 The lightweight and comfortable headset that puts the watcher right in the action of movies, television shows, video games, and sports broadcasts with a phone or laptop. Equipped with dual Micro OLED displays with crystal-clear optics and native 3D, LUCI immers promises a unique, immersion-on-demand (IOD) viewing experience, whatever the content. LUCI immers connects to phones, tablets, laptops, PC’s and gaming consoles such as the Nintendo Switch to provide a range of high-def viewing experiences. View content from all of the top streaming services including Netflix, Hulu, Amazon Prime, HBO, and YouTube for a one-of-a-kind immersion-on-demand experience. The new LUCI immers will be launching pre-orders on Kickstarter on March 19, 2019, for those looking to get in early for a discount. The first 100 units will be sold for $499.00 at Super Early Bird Pricing on Kickstarter, less than the expected MSRP. An exclusive Kickstarter version will also be available. The units are expected to ship in early fall 2019 and are currently in production.